Nick Lowe: Marie Provost (Bowi EP) Stiff. Back in the summer of 1977 when I bought Nick Lowe’s Bowi EP, I had no idea of the subject matter of the song Marie Provost. The story that Basher incorporates into this bright and breezy sounding song is supposedly that of Marie Prevost – and don’t ask me why he made that slight alteration to her name. Prevost was as Lowe puts it a ‘mysterious angel of the silent screen’ who worked with some big names in Tinseltown and was regularly cast as a flapper in the Roaring Twenties. She experienced problems though adjusting to the world of the talkies. She began to pile on the pounds. Parts began drying up. Se began hitting the bottle. She couldn’t dry herself out. According to Kenneth Anger’s sordid and sometimes unsubstantiated book Hollywood Babylon, Prevost was found dead in her apartment by cops, her corpse half-eaten by her starving pet Dachshund, who had nothing else to survive on. The veracity of Hollywood Babylon has been disputed since the day it came out. In fact, it was banned within ten days of its original publication in English in 1965 and wouldn’t find its way back into print until a decade later when my guess is that Nick Lowe read a copy or at least discussed the Prevost story with someone who had got his or her mitts on the book. Well, to be fair, it also went on to inspire a great track too, albeit a great track that is definitely more than a little sick and very probably wilfully inaccurate. The not so salacious truth of the matter? In all likelihood the pet pooch had tried to rouse the dead actress and in doing so left some teeth marks on her body. Joining Marie Provost on the EP were Born A Woman (a song originally performed by Sandy Posey), Shake That Rat and Endless Sleep. Just in case you don’t know why Lowe called the EP Bowi, then Google is your friend, albeit a friend that insists on incessantly spying on you. Startpage is maybe a better friend to have. The song later made its way on to Nick’s 1978 album, Jesus of Cool, or Pure Pop for Now People, as it was re-titled for the rather more God-fearing American market. More Nick Lowe in the coming months, folks. Finally a quick mention for Stuart Cosgrove, the author of Hampden Babylon, which obviously took the template of the Anger book but substituted bevvied up Scottish footballers like Jinky Johnstone out on the randan in Ayrshire coastal towns for depraved and drug addled movie stars and celebrities living in la-la land. 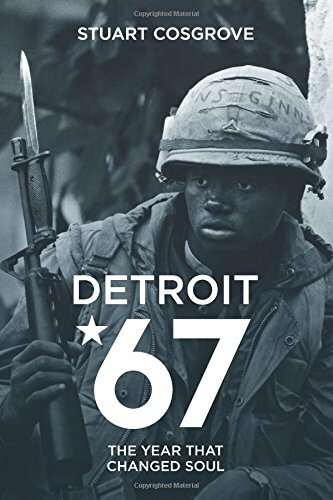 On an entirely different theme is Cosgrove’s soon to be published Detroit 67, which details an incredibly dramatic and creative musical year in the Motor City focussing on acts such as The Supremes, Marvin Gaye and The MC5 during a time of urban riots, revolutionary counterculture and the escalating war in Vietnam. For Stuart’s Detroit 67 Facebook page, here you go. And for a great blog featuring six of Stuart’s favourite artists from Detroit, click here. I doubt many really imagined that the Snakeheads were going to be one of those bands that just keep on going on and on, eventually churning out albums for the sake of it and going through the same pedestrian motions any time they stepped on to a stage to perform. They always possessed a sense of the volatile and unlike many other guitar acts of today, they never gave any hint of succumbing to careerism. In their very short time together, they were never scared to take risks. From Amphetamine Ballads, one of the finest Scottish albums of recent years, this is Where is My Knife? Best of luck to the guys whatever they get up to next. Some critics might accuse The Jacques of trying to clone the anthemic indie/punk clatter and chaotic charm of The Libertines but, hey, they’ve only been on the go for around a year and look at how young the singer looks and sounds! (I’m guessing that the combined age of all four band members would roughly equal the age of a single Rolling Stone). Signed to 25 Hour Convenience Store (Libertine Gary Powell’s label), the lads have a brilliantly invigorating new single called Weekends out today and here it is. Be proud, boys, be very proud of this song. You expect fantastic independent labels to emerge in cities like London, Manchester and Glasgow but, remarkably, one of Britain’s best new labels, Lost Map Records, is run by Johnny Lynch (The Pictish Trail) from his home in Eigg, which, if you don’t know, is a tiny island in the Inner Hebrides with some genuinely breathtaking scenery and a population of less than one hundred. Home to artists like Insect Heroes and Kid Canaveral, the latest LM release is the Dross EP by Tuff Love – their debut EP incidentally was titled Junk. In 2014 the band toured Britain and mainland Europe as well as finding their way onto the bill at a string of festivals including Glastonbury and Wickerman. You’ll be hearing more from Tuff Love here in the future but for now, from Dross, this is That’s Right. And finally, I only discovered Perpignon’s The Limiñanas a few months ago through the Franz Ferdinand curated Late Night Tales compilation, where their almost impossibly cool track The Darkside segued masterfully into the vaudeville rap of Ian Dury’s Reasons to be Cheerful Part 3. I was instantly smitten. They have just brought out a new album Traité de Guitarres Triolectiques (à l’usage des portugaises ensablées), where they’ve been joined by Pascal Comelade, who in the past has collaborated with a interesting bunch of musical talents such as Robert Wyatt, Faust and P.J. Harvey. 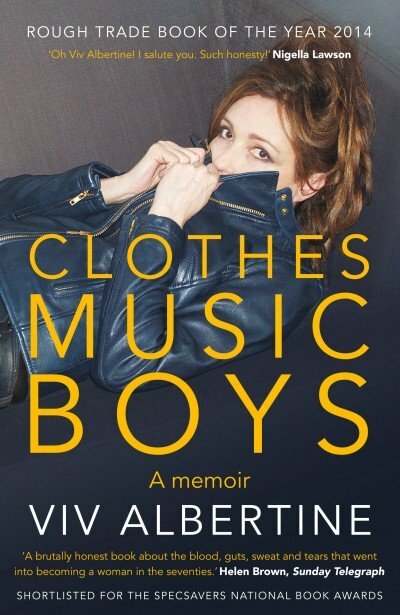 Out today is the paperback edition of Viv Albertine’s Clothes Music Boys, the memoir formerly known as Clothes, Clothes, Clothes. Music, Music, Music. Boys, Boys, Boys – a title that several outlets apparently frowned upon, some using it as an excuse not to stock the book. I preferred the original title myself but I thought it was a good idea to call a post of mine A Former Dreamboy & A Former Dancing Pig Discuss Punk, Doctor Who & Independence. Bet I’d have had more hits if I had mentioned Craig Ferguson and Ian Rankin by name. Voted music book of the year by The Sunday Times, The Hollywood Reporter and Mojo (and this blog too) as well as making a lengthy stay in the non-fiction bestseller lists in Britain, Clothes Music Boys is written with a searing honesty, with its author unafraid to admit to a string of contradictions in her personality. Albertine also demonstrates a willingness to reveal the kind of details that most autobiographies are happy to ignore. One example of this is the unflinching way she writes about close friendships: for instance, in 1976, together with Vivienne Westwood, she visits Sid Vicious, her former flatmate, former bandmate and someone she obviously adores, when he is imprisoned in Ashford Remand Centre, accused of throwing a glass that hit a female punk fan at the 100 Club in London – the girl losing her sight in one eye as a result of the incident. Sid is depressed and scared of his fellow inmates, who he clearly believes are more vicious than him. He assures his visitors that he is innocent and pleads with them to do all they can to help get him out. Luckily for poor Sid, the charges against him are eventually dropped due to a lack of evidence. No one can really say for sure who threw the glass. A year later Viv tells us that he admits to her that it was him. Uniquely for a bio from a central character of the punk era, CCCMMMBBB not only manages to remain fascinating after the part of the subject’s life that I thought would hold the most interest to me – in this case her time as a Flower of Romance and the early days of The Slits – it gets even better in what Viv calls Side Two, where she teaches aerobics, studies film, undertakes IVF treatment, is diagnosed with cervical cancer and eventually, decades after selling her guitar, makes the decision in her 50s to relearn the instrument and relaunch herself as a musician. The fact that her autobiography has been such a success must be very pleasing for Viv as her solo album from 2012, The Vermilion Border, was ignored by many critics and also underrated by some of the others who did bother to review it. I think it’s one of the finest releases of recent years. In her book, Viv mentions meeting Gareth Sager from The Pop Group at Glastonbury, where they run about in the mud and Gareth laughs a lot and says surreal things. The Pop Group, as you may already know, are just about to release their first album in 35 years. Citizen Zombie is out on Freaks R Us on Monday, February 23rd. For Viv Albertine’s Facebook page, click here and for the official Pop Group site, click here.